Suffragists march in a 1912 rally in New York City. In 1920, after decades of struggle for the right to vote, the Nineteenth Amendment's ratification granted female suffrage. The Nineteenth Amendment was enacted in 1920, after a 70-year struggle led by the women's suffrage movement. The groundwork for the suffrage movement was laid in 1848 in Seneca Falls, New York, now considered the birthplace of the women's movement. Here Elizabeth Cady Stanton drafted the Declaration of Rights and Sentiments, which demanded voting rights, property rights, educational opportunities, and economic Equity for women. Rather than face the difficult task of obtaining approval of an amendment to the U.S. Constitution from an all-male Congress preoccupied with the question of Slavery, the suffragists decided to focus their attention on the separate states and seek state constitutional amendments. The state-by-state effort began in 1867 in Kansas with a Referendum to enfranchise women. The referendum was defeated, but that same year the western territories of Wyoming and Utah provided the first victories for the suffragists. The movement then suffered a series of setbacks beginning in January 1878 when the voting rights amendment was first introduced in Congress. The full Senate did not consider the amendment until 1887 and voted to defeat the bill. The suffragists continued their state-by-state strategy and won a referendum ballot in Colorado in 1893 and Idaho in 1896. The suffragists mounted a final and decisive drive in the second decade of the 1900s with victories in Washington in 1910 and California in 1911. The following year Arizona, Kansas, and Oregon gave women the right to vote, and in 1913 Illinois also passed measures supporting suffrage as did Montana and Nevada in 1914. Women in eleven states voted in the 1916 presidential election. By this time the United States was also involved in World War I, which brought national attention to the suffrage movement as well as to the important role women played in the war effort. During the war, an unprecedented number of women joined the depleted industrial and public service workforce. Women became an active and visible population of the labor sector that benefited the national economy. By the end of 1918 four more states—Michigan, Oklahoma, New York, and South Dakota—had approved women's suffrage. With the requisite two-thirds majority, the U.S. House of Representatives introduced the amendment in January 1918. The vote was initially postponed, and the amendment was later defeated in October 1918 and again in February 1919. On June 4, 1919, almost 17 months after its introduction by the House of Representatives, the amendment was finally passed by the Senate. Having already considered and debated the voting rights issue for several years, the states ratified the amendment quickly. In August 1920 Tennessee became the thirty-sixth and last state necessary to ratify the enactment. With ratification complete, the Nineteenth Amendment was added to the U.S. Constitution on August 18, 1920. Brown, Jennifer K. 1993. "The Nineteenth Amendment and Women's Equality." Yale Law Journal 102 (June). Clift, Eleanor. 2003. Founding Sisters and the Nineteenth Amendment. Hoboken, N.J.: John Wiley & Sons. Hillyard, Carrie. 1996. "The History of Suffrage and Equal Rights Provisions in State Constitutions." BYU Journal of Public Law 10 (winter). Lind, Joellen. 1994. "Dominance and Democracy: The Legacy of Woman Suffrage for the Voting Right." UCLA Women's Law Journal 5 (fall). Anthony, Susan Brownell; Equal Rights Amendment; Women's Rights. The most important aspect of the 19th amendment was incorporating changes in the Article 175Aof the constitution. The focus of the discussion will be on setting measurable objectives to advance equality for women by 2020, the 100th anniversary of the 19th Amendment. Rajitha Senaratne confirmed that President Maithripala Sirisena has sought the Supreme Court's opinion on application of 19th amendment to the Constitution to his first term of the office. gov/womens-equality-day/) stated : "Nearly one century ago, with boundless courage and relentless commitment, dedicated women who had marched, advocated, and organized for the right to cast a vote finally saw their efforts rewarded on August 26, 1920, when the 19th Amendment was certified and the right to vote was secured. Will Donald Trump Recognize Women's Equality Day? He said after 18th amendment in the constitution, PPP government had introduced 19th amendment to reduce tension between the government and the judiciary. My suggestion to the (apex) court is that the issue of immunity should be referred to Parliament like the issue of the appointment of judges was referred to Parliament [and resolved] in the form of 19th Amendment," he added. He said the 1973 constitution was consolidated by 19th amendment and now the 20th amendment has completed the parliamentary democratic system by introducing caretaker government for holding elections. In 1918, after continual pressure from suffragists, President Wood-row Wilson backed the proposed 19th Amendment. 14, 1920, suffragists had good reason to believe that ratification of the 19th Amendment was near, and that women's right to vote was about to become the law of the land. Our founder, Carrie Chapman Catt, proposed the idea for a League of Women Voters to enable others to "finish the fight" that was begun with the passage of the 19th Amendment. The 19th Amendment to the Constitution was ratified in 1920 and gave women the right to vote nationwide for the first time, although a few states had already allowed it. 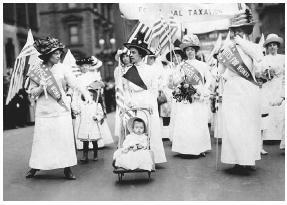 Most American women gained the right to vote when the 19th Amendment was ratified in 1920.